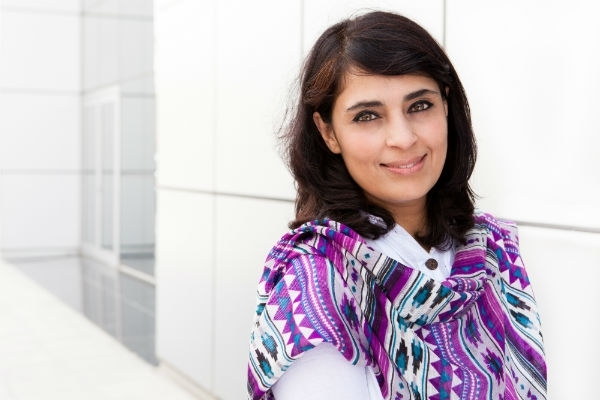 Samar Minallah—a documentary film-maker, founder of Ethnomedia (a non-profit independent media think tank), and a human rights and women’s rights activist—is one of the most influential Pashtun media personalities. The good thing is that she has received much praise and recognition for her accomplishments and her constant efforts to contribute to the condemnation of gender inequality and discrimination in our society. Let us talk about her some more. Let’s recognize her some more, celebrate her some more, and let her know that we are proud of her. Let’s let her know that she gives us reasons to believe that Pashtuns are not a lost people. Samar Minallah’s family of activists and leaders hails from Sirikot, Hazara, in Pakistan’s northwestern province of Khyber Pakhtunkhwa. She is the daughter of Nasrum Minallah, who was a distinguished senior civil servant from Pakistan, and Bilqees Minallah, a former member of the Pakistani National Assembly. Her sister, Fauzia Minallah, is also an important name that everyone should know about. Fauzia is a political cartoonist, a writer, and an activist. You can read more about her at her own website here. Samar and Fauzia’s brothers, too, are servicing their people and nation: Athar an d Akmal. Athar is a High Court lawyer in Pakistan and was “the crusading lawyer in the nationwide anti-Musharraf lawyer’s movement.” And Akmal, graduating as a medical doctor, also joined Pakistan’s civil services. Awarded a Certificate of Recognition by ABU/CASBAA Unicef Child Rights Award 2005 for upholding the principles of the UN convention on the Rights of the Child in programming for and about girl child in Pakistan . Amongst the top five programs selected from all over Asia, Swara was the only one selected in this category. Samar has successfully presented to the world and to Pashtuns themselves the image of Pashtun wo men, especially in villages. One such video is “Bibi Sheerenay — where Honour comes from,” a song sung by popular Pashto singer and musician Gulzar Alam; it outlines the typical day of an ordinary village woman from the moment she wakes up till the moment she sleeps. Samar has also picturized and directed “Allaho, a Lullaby to a Daughter,”, a Pashto/Dari mix sung by another popular Pashto singer Naghma; the song highlights the importance of educating females, advising girls to “become wise, become educated, help humanity.” Another music video she picturized is “Warawaee Lasoona: the Dance of Unity,”, a song promoting unity and love; the poem “Tora Tyara” (“Darkness”) was conceptualized by her as well, although written by Zaitoon Bano and translated by Sherzaman Taizi.Her documentaries include “Dar Pa Dar: Where the Heart Lies,” which depicts the lives and struggles of Afghan refugee women in NW Pakistan; “Kuch Khwab Hai Meray” (“I Have a Dream”), documenting the abuse of child servants and child laborers in Pakistan, featuring the children themselves, speaking about their experiences, their mistreatment by their owners, their work; “Land of a Thousand Colors,” which celebrates the cultural diversity of Pakistan; and “The Hidden Colors of Khyber Pakhtunkhwa,” filmed for UNESCO in 2005 in an effort to raise awareness of the vibrant culture of the Khyber Pakhtunkhwa province, highlighting aspects of the Pukhtun culture that contradict popular media’s image of Pashtuns. 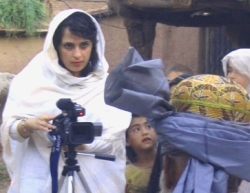 Some of Samar’s documentaries can be accessed online, along with more information about her work, at ethnomedia.webs.com. 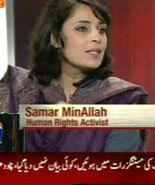 Long live Samar Minallah! May our nation and this world continue being blessed with more Samar Minallahs, may she inspire us all to educate and raise our daughters and sons so that they, too, can spend their lives serving humanity to promote peace and justice. This entry was posted in Afghans, beauty, Death to patriarchy, feminism, gender, human rights, Pashto, Pashtun Leaders, Pashtuns, social justice, why we need feminism and tagged Pashtun Leaders, Pashtun women, Pashtun Women Leaders, Pashtuns. Bookmark the permalink. You stand corrected: She’s Pashtun.